This book is written and narrated by the author.He did a good job narrating this audiobook. He also read books 1 & 2. I started with book 3 so I was bit at a loss at the progression of the story. The story was okay. It was hard for me to follow since I have not read the first two books. I received this audiobook for free through Audiobook Boom for my unbiased review. Quite different from the first two books, the story of RazorsCut brings in many new characters. One of the beloved characters die. A new character, Sam, a 12 year old boy brings much more lightheartedness to the story's progression. This book focuses on Roc (sp) and Caroline's entrance into a 3rd land. I was hooked partway through the first book, but really, none of the books are complete. None of them stand alone. You must read all of them or BIG parts of the plot will not be understood. And some plot points are left unmanaged. I am hoping that they get tied together in later books. Regarding the audio of the book, the author himself is the performer. And he uses a variety of voices. Kudos. Even MORE fantastic is that he sings a couple of times too. But for some reason, the book skipped backwards a number of times. One time it was two whole chapters back. Most of the time it is between 2-14 seconds. Not sure if was my phone, my Bluetooth headset, or the available audio. So, star rating less than perfect due to audio quality and loose plot points. Performance is fantastic, the story is captivating. One suggestion for the author would have been to include your own new swear words. Not the f-bomb or s***. And when the heck to we get to figure out what the "big event" was that began this apocalyptic world? I'm super antsy for the next book. I don't know if it's the authors voice or just the story itself but I just couldn't get into it. If you could sum up RazorsCut in three words, what would they be? i really enjoyed this and can't wait for the rest of the series. I don't mind that it may be a little cliche. I mean at this point in the genre what can you write that won't be. The ideas and the way it makes you respond is what makes it worth the trip. I don't feel like I'm being bullied by the authors politics or feelings. The story just is what it is. A good romp through post apocalypse with all the necessary elements for a good story. What other book might you compare RazorsCut to and why? I can't recall a really good comparison. It's a standard post apocalypse story but unique enough to not be comparable. What about Troy Hallewell’s performance did you like? i need to go back to work now. LOL. hurry up with the next book. You can see how it ties together before the end, but with so many new major characters, Tying up the story any time soon may be questionable. 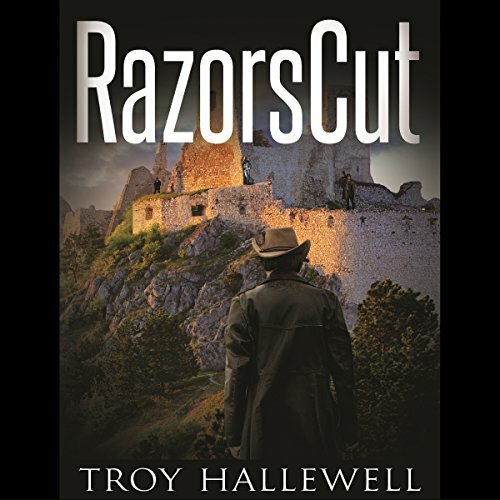 Where does RazorsCut rank among all the audiobooks you’ve listened to so far? I thought this was a well rounded listen. I think the author did a great job narrating the book. Since I jumped into the series at book three I like that I didn't have to read the other two to catch on. In my mind those are great books. Thank you for the share. Like some of the other reviewers, I started this book without having read the previous two books. Consequently, I'm pretty much lost as far as the plot goes. The author/narrator tries to give his characters different voices, with varying degrees of success. I doubt I'll finish this book. I jumped into this series with this book so I really did not get the jest of it right off. But, as it progresses, things become a little clearer. If you plan on reading this or listening like I did, find the first 2 books and listen to them first. After I did that, this one fell right into place. The author and narrator are one in the same. He did a really good job narrating for this being his 3rd book. He also read books 1 & 2. The lay of the land is described so that you feel that you are there with the characters as the story progresses. It was a good read and I would recommend this book to all I meet. This was the 1st time listening to this writer and I enjoyed the book.